Are Two-Faced Runners Pulling A Fast One? Like flotsam that won’t go out to sea, vinyl LPs are back again whether we like it or not. And they’re not the only throwback performing improbably well these days. With a pair of running shoes and Internet access, jogging boomers are too. With Al Gore’s “invention” at their fingertips, the results page of the next masters track meet can be rewritten to read like Fast Times At Ridgemont High. Stay with me, and I’ll explain. As an unapologetic runner, I’m not usually quick to cast a cold eye on my sport and on those who fill out its roster, but in this uncharacteristic essay I see that an ego-salving practice takes its share of heat. If you’ve ever participated in roasting an old friend, you’ll know how to take this piece: with more than a grain of salt in the baste. Making aging boomers feel better about aging is more than a cottage industry in Western culture. Peer into the driver’s seat of a Western nation’s economy, and you’ll see who’s well-heeled foot is on the accelerator: a graying boomer who’s forgotten to switch the turn-signal off. From sports cars to cosmetic surgery, boomers refuse to go gentle into that good night. And why should they when they’ve got the clout and the capital to keep turning the tables to whatever side suites them best? The aging are quick to remind us that age is just a number. And in the case of aging runners, they hasten to add that it’s actually two numbers. One of these numbers–their age-adjusted time–has literally been calculated to make them feel better about aging. And again, why not? If boomers invented the jogging boom to stay young, is it any wonder that it’s still keeping them artificially ageless today? Jogging seemed innocent enough. Who knew it was really a Patrick Nagel-esque portrait of Dorian Gray fabricated to absorb year upon year of entropy while joggers in striped knee-socks project (or at least harbor) the illusion of conserving energy like some perpetual-motion machine they bought at The Sharper Image? Age-adjusted times have become the funny money of the running world. It’s the idealized portrait that gives the counterfeit away. What began as an algorithm in the brains of white-coated sports science wizards has become common coin on a dozen Web calculators. For Me generation runners, the best weapon in the war against aging may be to keep denying it–even when the writing is on the wall (or wherever a given race’s results are posted). The next best weapon may be having recourse to a number that makes that denial plausible. Who needs cosmetic operations when arithmetic operations cost nothing and carry no risk of infection? For the runner not yet in his or her second childhood, I’ll explain how it works: a 65-year-old man runs a 10k in 50:00, and the calculator tells him it’s like a 30-year-old man’s running a 10k in 38:27. A sub-40 minute 10k! Go figure. As running super foods go, I’ll put cooked data up against chia seeds any day of the week. Here’s an additional example. At her present age of 62, race bandit Rosie Ruiz would need to run a time of 3:33:36 to match her 1980 Boston Marathon “winning” time of 2:31:56. I’ll bet that even with the aid of age-adjusting, she’d still need a lift. Imagine what would happen if the majority of races began adopting an age-adjusted format. With an age-adjusted time following one’s name, it would be hard not to cut a fine figure. But this bonfire of the vanities could have an unintended victim. With age-adjusted times, age-group awards would become moot, signaling hard times ahead for the plastic trophy industry. If a 59-year-old’s age-adjusted 16:15 5k (a very respectable 20:02 in reality) is better than a 26-year-old’s actual 16:20 5k, the 59-year-old “wins” the race outright, never mind that the 59-year-old was too far behind the 26-year-old to see him finish. (I knew there had to be a practical use for imaginary numbers.) Three trophies for each gender, and race announcers could stop going hoarse calling out 30 names, half of which they’ll never be able to pronounce. It used to be thought that nothing short of cryonics would enable a man to run a 4:30 mile in 1982 and again in 2015. That was before boomers discovered the one weird trick to running faster: live long enough and any mile you can slog through is world class. Doesn’t this make some centuries-old Methuselah, and not Roger Bannister, the first sub 4-minute miler? 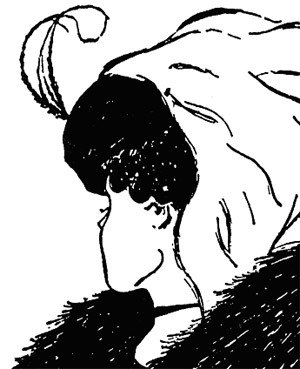 Another way to look at age-adjusted times is to envision the famous ambiguous line-drawing that represents either the portrait of a young or of an aged woman depending on one’s viewpoint. Once a brain has learned to see both faces, it may switch from the old to the young and back again with ease. But why would it want to? If I’ve been a little hard on boomers, I have an excuse. You see, I myself am approaching the age where, I’m told, I can get away with more. And now it’s time to fess up. I’ve used the age-adjusted calculator. Stick with running long enough and you will too. Heck, stick with running long enough, and your “29 and holding” will break the calculator! Flattery may not get flatterers everywhere, but it may get aging runners to keep lacing up. Eventually the sobering numbers may find every running lifer reaching for something with which to spike his drink; think of it as a little splash to keep the cocktail party interesting as the evening winds down. Before getting the hang of it, an age-adjusted runner may feel like Alice in the Red Queen’s race. “Here,” the Red Queen says, “it takes all the running you can do, to keep in the same place.” Run as hard as one can for decades, and one’s age-adjusted times remain roughly the same. Or do they? 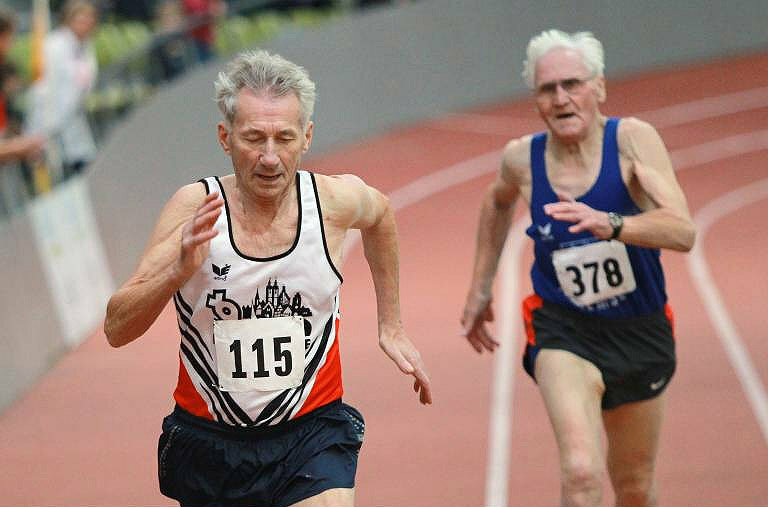 In the past 12 years, this aging runner has lost a little over a minute in the 5k. And at the same time, using the age-adjusted calculator, I’ve “gained” a minute at the same distance. How’s that for saving face? And how’s that even possible? It looks like someone thought to slip the Ghost of Christmas Future into the machine. Maybe jogging boomers planned the calculator to be a kind of time capsule, a medium through which to reconnect with hopes they deferred while Cocoon was playing to packed theaters. Who said the aging population doesn’t know how to use the Internet? To loosely paraphrase Mark Twain and Benjamin Disraeli, there are lies, damn lies, and age-adjusted times. Even octogenarian running phenomenon Ed Whitlock, whose age-adjusted times place him on par with the world’s best marathoners, is on record as saying that he suspects there’s something wrong with the age-adjusted tables. Defenders of the calculator tell me that while spending a good portion of the past 12 years running, I’ve improved my running economy. (Weren’t we saying something like that about the Ford Pinto just before it was recalled?) It’s going to take a better argument than that to buy off the skeptic in me. Calculating equivalent times as a thought experiment to amuse oneself and one’s running buddies is one thing, but parleying them into a token of running “progress” veers uncomfortably close to pulling a fast one. What the age-adjusted calculator does is create a pocket universe of decreasing entropy in a real universe where things, as a matter of course, fall apart (resulting in the sort of paradox that Doctor Who wouldn’t touch with a ten-foot sonic screwdriver). In thermodynamics, the lost entropy always creates chaos somewhere else; it’s the law (think of Dorian’s ageless low entropy and of the accumulating havoc wreaked on his portrait). But where, in the case of an “improving” age-adjusted runner, does the chaos end up? Could it be that while we’re running “better” than we did in 1982, the truth is taking a beating?